Do you know the significance of Pantone Colour of the Year? Rather, do you know what Pantone Colour of the Year is all about? What is the big deal about it and why are we emphasizing on it so much? Let’s enlighten you lovelies a little on it. Pantone colour of the year IS A HUGE DEAL! The colours that the secret panel comes up with every year eventually becomes a great deal in the art industry, fashion industry and WEDDINGS! So, now you understand why such hype. This year’s Pantone Colour of the Year is Rose Quartz and Serenity. Since, we’ve already given you tips on how to incorporate Rose Quartz in your wedding. We thought why not give you suggestions on last year’s Pantone Colour of the Year – Marsala. In Indian weddings, there is no way you can escape the colour red. From a brides red mehndi, chooda, bridal outfit, sindoor to the red gathjoda that binds the couple together for the saath phera, the red hue holds a deep significance. Marsala is a combination of robust, earthy wine red and maroon. You could say the colour of a pomegranate, only darker. This extremely beautiful and rich shade can be incorporated into your bridal attire, décor, invite, cake, favours and more. 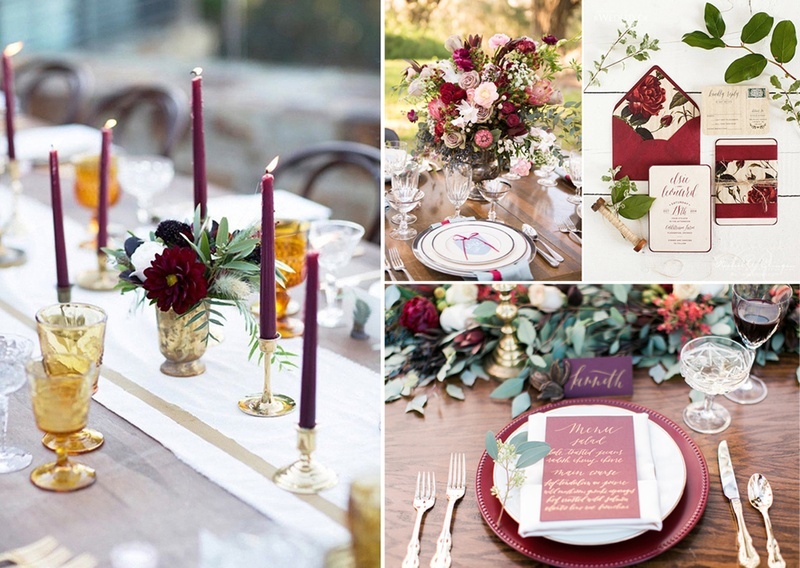 If you’re looking for ways to incorporate the subtly seductive Marsala in your wedding, we’ve got tons of inspiration right here. Let’s begin! For wedding invites, the best way you can play safe is by keeping the envelope Marsala coloured while your cards can be a simple white with the details written in Marsala hue. Should you want to try a trending technique, laser cut wedding invitations in Marsala hue or water coloured invites could be the best choice. What’s a wedding without a cake? Tasteless, we say. For wedding cakes, you can either go for dainty Marsala coloured flower additions or paint the whole cake Marsala, either way they’re a feast to the eye and tummy. Whether it is an outdoor or indoor wedding affair, Marsala coloured flowers, table runners, napkins and/or even cutlery can create the perfect rich and romantic setting for your reception or pre-wedding festivities. Here we suggest you some cool and epic ways in how you can dress the tables for the occasion. We love this section the most, simply because, we love things that are DIY, which can help our lovelies cut cost. IF you are a DIY bride or a bride having a wedding on a budget, these cute and super easy suggestions are sure to come handy. You don’t need elaborate vases for the centrepieces to make your table look chic, a small little wooden box filled with your choices of flowers, including Marsala coloured flowers and you’re good to go. These perfectly rustic yet super elegant centrepieces, one can easily DIY for their wedding. Another rustic option can be antique centrepieces that you can easily buy from Mumbai’s famous Chor Bazaar or Delhi’s Janpath and Tibetian Market. Fill these antiques with flowers and no, you don’t need to have the same centrepieces for all the tables. Think hatke and get creative. Add fine flower details to the chairs in your aisle. Extend your theme to your food and drinks to maintain consistency and keep your guests immersed in the celebration throughout. Indian weddings are incomplete without desserts. See how you can incorporate Marsala in your wedding desserts. As we mentioned earlier the colour red is extremely significant in Indian culture and bridal attire too. Though modern brides think otherwise and are seen opting for light and trending hues, such as fuschia, lime green and so on. There are still some brides like Urmila Matondkar and Bipasha Basu who prefer the traditional red. For the kind of brides who want to go for the traditional red yet stay in trend Marsala comes to your rescue. We’ve got some great inspirations lined up for you. Scroll. Looking for matching Marsala footwear inspiration? We’ve got you covered. Loved it? Let us know in the comments section below. Lavender Wedding Theme Ideas That Will Stun You!